Production photo by Hugo Glendinning. The clue is right there in the title—Long Day’s Journey Into Night is a serious undertaking (for actors and audience alike) thanks to its lengthy running time of three hours and 25 minutes, including an intermission. But the rewards of this important work of American literature are great. Now playing at the Wallis for a limited engagement is a revival which originated at the U.K.’s Bristol Old Vic in 2016. Director Richard Eyre incorporates a lot of fussy actor’s business and physicality during the first half of the evening, but nevertheless guides his talented ensemble of five to deliver well-orchestrated performances. Eugene O’Neill’s semi-autobiographical four-act drama charts the dysfunction that permeates the Tyrone family, consisting of James and Mary and their grown sons Edmund and Jamie. Written by American playwright Eugene O’Neill in 1941–42, but first published in 1956 (three years after the playwright’s death – at his expressed stipulation), the play is widely considered to be his magnum opus. Long Day’s Journey Into Night premiered in Stockholm, Sweden, in February 1956 and then opened on Broadway in November 1956, winning the Tony Award for Best Play. O’Neill was posthumously granted the 1957 Pulitzer Prize for Drama (his fourth) for the work, which is regarded to be one of the finest and most powerful American plays of the 20th century. Suspicion and regret infect and destroy the lives of this troubled family. Hampered by its somewhat old-fashioned mid-century dramatic style, O’Neill’s play is built on rhythms and repetitive patterns. Time and again characters frequently blurt out accusations and recriminations then apologetically choke them back within the same breath. There is much talk of how beautiful Mary (Lesley Manville) used to be and how painful her arthritic hands are now. It’s soon evident that this is an excuse she uses to justify a debilitating morphine habit that haunts the household. Nominated for an Academy award last year for her role in Phantom Thread, Manville is equally magnificent here with this challenging stage role. Obscuring his native British accent with a generic American one, Jeremy Irons is outstanding as the cheapskate patriarch, blustering and ranting one minute then begging for forgiveness the next. He mines as much comedy from the material as he can throughout, although Irons is careful never to derail the drama with too many antics. Just listen as the old skinflint coughs and growls uncomfortably when he opens his wallet to hand his ailing son some spending money. 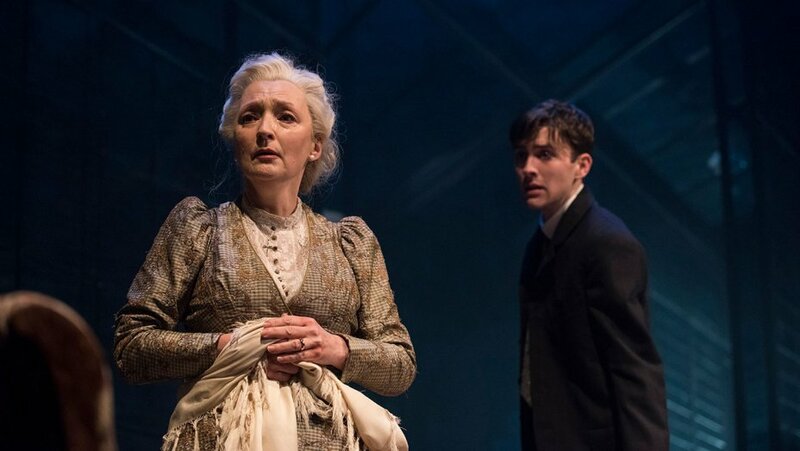 Curiously, the Tyrone sons appear to have markedly different accents, which would suggest that they were raised in different families… Matthew Beard is good as the ailing younger son, Edmund (the stand-in for the playwright himself) but too often sounds as if he might be from Boston? Rory Keenan plays older son Jamie well, although some of his monologues lacked conviction. Jessica Regan is good in a small but memorable role of the Irish maid Cathleen. Peter Mumford’s sensitive lighting design is outstanding throughout, but especially so during the play’s profoundly moving final moments. His illuminations beautifully complement Rob Howell’s scenic design of the stately two-story Connecticut house. We see walls that manage to be both diaphanous and reflective, indicating that there is no hiding from the dark secrets in this house. Unfortunately the staircase is hidden upstage, diminishing the drama of Mary’s entrances and exits. Howell also does well with perfectly serviceable costume design. 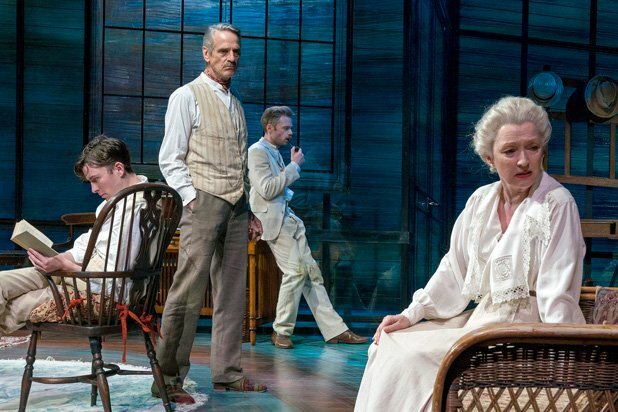 Eugene O’Neill’s Pulitzer Prize-winning masterpiece Long Day’s Journey Into Night is playing at the Wallis Annenberg Center for the Performing Arts (The Wallis) for a limited three-week engagement from Friday, June 8 through Sunday, July 1, 2018. 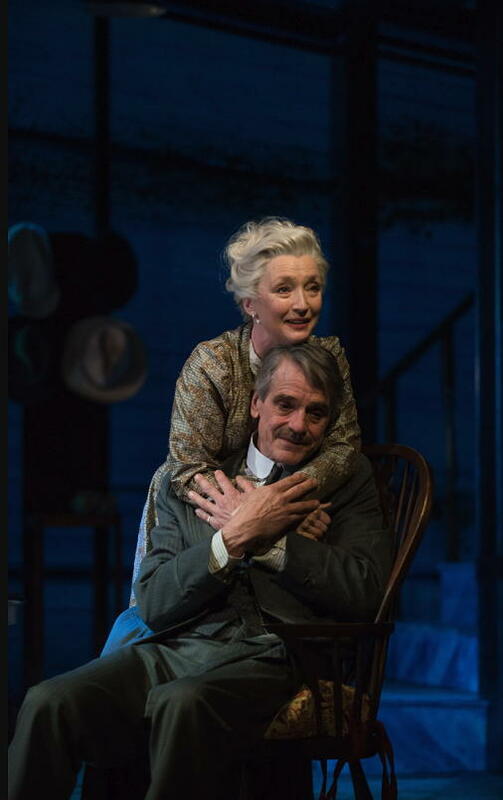 Richard Eyre’s acclaimed Bristol Old Vic production stars Academy Award winner Jeremy Irons (Brideshead Revisited, Reversal of Fortune, “The Borgias”) and Olivier Award winner and Oscar nominee Lesley Manville (Another Year, “Harlots,” Phantom Thread). Matthew Beard (The Imitation Game, The Riot Club), Rory Keenan (BBC’s “War & Peace,” “Peaky Blinders”) and Jessica Regan (reprising the role as Cathleen from the 2016 Bristol Old Vic production) round out the ensemble cast. For more information or to purchase tickets, visit TheWallis.org/LongDays, call 310.746.4000, or stop by in person at the Wallis Annenberg Center for the Performing Arts Ticket Services located at 9390 N. Santa Monica Blvd., Beverly Hills, CA 90210. The Wallis also offers three different options to subscribe to the 2017/18 season: the Premium Subscription Series; the Design-Your-Own option; and the new 3-show Flex Pass for $99, created for busy young professionals—39 and younger—giving the most flexibility to join The Wallis family of subscribers. Learn more at TheWallis.org/Subscribe. Haunted by the past but unable to face the truth of the present, James and Mary Tyrone and their two sons test the bonds of a family caught in a cycle of love and resentment. As day turns to night and each member of the family indulges in their vices, the truth unravels leaving behind a quartet of ruined lives. Lesley Manville and Jeremy Irons CREDIT: HUGO GLENDINNING.